Ahead of this weeks Doyen of the Downs race, on Sunday 6th December i have had the chance to use a new pair of sunglasses, generously supplied by Ardblair Sports, of which i can already sing the praises of. 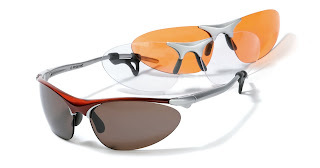 Polaroid Eyewear are world leaders in optics and lens technology and the inventor of polarizing lens technology and their sports range of eyewear demonstrates this perfectly. Both Alex and i have been given 2 pairs of the 7007 range, with 3 interchangeable lenses (Clear, Amber and dark), Now the winter may not be the sunniest time of year (especially in the UK), but the choice of lenses is ideal for someone like me who wears contact lenses. Friday last week i had my first run out in the glasses with amber lenses in late afternoon and i was amazed by how light and comfortable the glasses were. No fogging whilst running, even with a Buff over my nose in heavy traffic, forcing air upwards, no bouncing either and more importantly a clear field of vision, with the amber lenses lightening the gloomy afternoon. These have made a very pleasant change from the heavier denser framed sports glasses on the market, and will now be a a regular item in my kit bag and more importantly on my nose. Marks out of 10 - it can only be 10.